The 2012 Hyundai Genesis 3.8L luxury-oriented sedan receives a number of updates for 2012, including new exterior styling, an updated powerplant and a retuned suspension, which helps to improve agility. Outside, the Genesis 3.8L displays a revised front end with a new grille, a larger air intake opening, redesigned headlights with LED accents and new daytime running lights. In addition, Hyundai restyled the Genesis's side rocker panels, added power-folding side mirrors with puddle lamp functions and upgraded the side window surrounds with a brushed aluminum finish. In the rear, the 3.8L gets a new bumper with integrated dual chrome exhaust tips and redesigned taillights. The 17-inch alloy wheels have been updated as well. Inside, the 3.8L comes well-equipped with such standard features as leather upholstery, heated front seats, an 8-way power-adjustable driver's seat with power lumbar and a 4-way power-adjustable passenger seat. A leather-wrapped steering wheel and shift knob, push-button start, remote keyless entry and an auto-dimming rear-view mirror also come standard. Dual-zone automatic climate control with an outside temperature display keeps passengers comfortable, while an AM/FM audio system with SiriusXM satellite radio, Bluetooth, a CD player and a USB input jack provides entertainment. Under the hood, the 3.8L receives an updated 3.8-liter V6 engine with direct injection, which boosts horsepower to 333, up from 290 the previous year. Peak torque increases as well, to 291 lb-ft from 264. The V6 links to a new 8-speed automatic transmission with a Shiftronic manual-shift mode. Fuel economy numbers for the V6 check in 18/28 mpg. Safety features include 8 airbags, electronic stability control, traction control and 4-wheel antilock brakes with electronic brakeforce distribution and brake assist. The Hyundai Genesis 4.6L luxury sedan rolls into 2012 with a number of changes, including updated exterior styling, a new transmission and a more refined suspension. Outside, the 4.6L displays an updated front end with a new grille, a larger air intake opening, redesigned HID headlights with LED accents and new daytime running lights. In addition, Hyundai redesigned the side rocker panels, added power-folding side mirrors with puddle lamp functions and upgraded the side window surrounds with a brushed aluminum finish. In the rear, the 4.6L gets a new bumper with integrated dual chrome exhaust tips and redesigned taillights. Under the hood, power comes from 4.6-liter V8 engine, which puts out 385 hp and 333 lb-ft of torque with premium fuel. The engine links to a new 8-speed automatic transmission with a Shiftronic manual-shift feature. Fuel economy numbers for the V8 check in at 17 mpg city/26 highway. The 4.6L's roomy, comfortable cabin comes well-equipped with a wide range of upscale features, including premium leather upholstery, heated and ventilated front seats, heated rear seats and a leather-and-woodgrain steering wheel with a power tilt/telescopic column. The dashboard also gets the leather-wrapped treatment. The 8-way power-adjustable driver's seat includes power lumbar and memory settings, while the front passenger seat features 4-way power adjustment. Dual-zone climate control, push-button start, remote keyless entry and an auto-dimming rear-view mirror also come standard. Tech features include a navigation system with XM NavTraffic and a 17-speaker, 528-watt Lexicon Surround Sound audio system with Bluetooth, SiriusXM satellite radio and a 6-CD/DVD in-dash CD changer, all accessed through an 8-inch display and a multimedia controller. Hyundai also includes a rear-view backup camera and new 17-inch alloy wheels. Safety features include 8 airbags, electronic stability control, traction control and 4-wheel antilock brakes with electronic brakeforce distribution and brake assist. 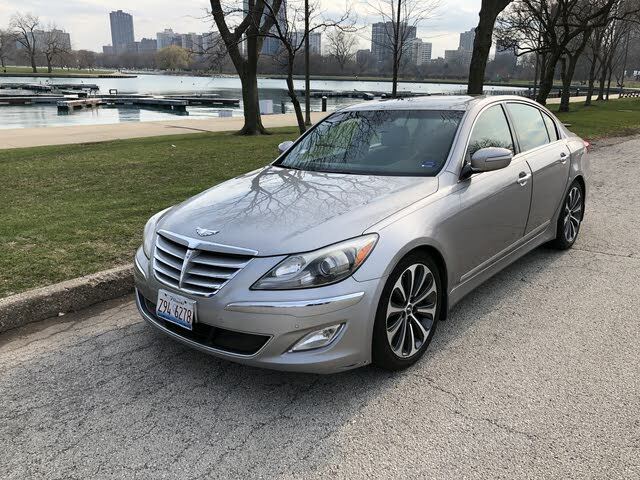 The 2012 Hyundai Genesis 5.0L combines a new 5.0-liter V8 engine and a new 8-speed automatic transmission with a luxury-oriented cabin and updated exterior styling. The new V8 powerplant develops 429 hp and 376 lb-ft, thanks to its high-pressure direct-injection system, and pairs with the 8-speed automatic, which includes a Shiftronic manual-shift mode. The EPA estimates fuel economy numbers of 16 mpg city/25 highway for the V8. Outside, the 5.0L displays a new grille, a larger air intake opening, redesigned HID headlights with LED accents and new daytime running lights. Hyundai also redesigned the 5.0L's side rocker panels, added power-folding side mirrors with puddle lamp functions and upgraded the side window surrounds with a brushed aluminum finish. In the rear, updates include a new bumper with integrated dual chrome exhaust tips and redesigned taillights. The 5.0L rides on a sport-tuned suspension and 18-inch alloy wheels. Inside, the plush cabin comes well-equipped with such upscale features as premium leather upholstery, heated and ventilated front seats, heated rear seats and a leather-and-woodgrain steering wheel with a power tilt/telescopic column. Hyundai also wraps the dashboard in leather. The driver's seat gets 8-way power adjustment with power lumbar and memory settings, while the passenger seat receives 4-way power adjustment. Tech features include a rear-view camera, a navigation system with XM NavTraffic and a 17-speaker, 528-watt Lexicon Surround Sound audio system with Bluetooth, SiriusXM satellite radio and a 6-CD/DVD in-dash CD changer, all accessed through an 8-inch display and a multimedia controller. Dual-zone climate control, push-button start, remote keyless entry and an auto-dimming rear-view mirror are also included. Safety features include 8 airbags, electronic stability control, traction control and 4-wheel antilock brakes with electronic brakeforce distribution and brake assist. New for 2012, the Hyundai Genesis 5.0 R-Spec sport luxury sedan delivers optimal performance and handling, along with a distinctive cabin and unique exterior colors and styling. Power for the R-Spec comes from a new 5.0-liter V8 powerplant, which pumps out 429 hp and 376 lb-ft of torque. It mates to a new 8-speed automatic, which includes a Shiftronic manual-shift mode. The EPA estimates fuel economy numbers of 16 mpg city/25 highway for the V8. The R-Spec rides on a sport-tuned suspension and unique 19-inch alloy wheels. It also receives unique HID headlights with dark chrome inserts. In addition, like all Genesis trims, the R-Spec gets a new grille, a large air intake opening, upgraded side window surrounds with a brushed aluminum finish and an updated rear bumper with dual chrome exhaust tips and redesigned taillights. Daytime running lights, foglights and power-folding side mirrors with puddle lamp functions are also included. Hyundai offers the R-Spec in Black Noir, Titanium Gray and Platinum Metallic exterior colors. Inside, the automaker equips the R-Spec with black premium leather upholstery, a black leather-wrapped dash and an all-black leather steering wheel, which distinguish it from the other Genesis trims. Other upscale features include heated and ventilated front seats, heated rear seats and a power tilt/telescopic steering column. The driver's seat features 8-way power adjustment with power lumbar and memory settings, while the passenger seat gets 4-way power adjustment. Tech features include a navigation system with XM NavTraffic, a rear-view camera and a 17-speaker, 528-watt Lexicon Surround Sound audio system with Bluetooth, SiriusXM satellite radio and a 6-CD/DVD in-dash CD changer, all accessed through an 8-inch display and a multimedia controller. Dual-zone climate control, push-button start, remote keyless entry and an auto-dimming rear-view mirror are also included. Safety features include 8 airbags, electronic stability control, traction control and 4-wheel antilock brakes with electronic brakeforce distribution and brake assist.